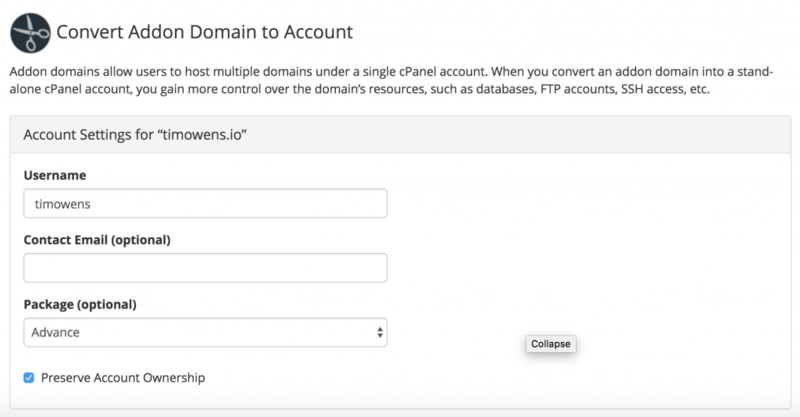 You may run into a scenario where a user had setup an addon domain for an organization within their own personal cPanel account and later it makes sense for that to be a cPanel account on its own. cPanel now offers a tool to make this process easier. You’ll find it in WHM under Convert Addon Domain to Account. The interface lists all addon domains on your server and you can search for the one you would like converted to a cPanel account and who its owned by. Clicking Convert will allow you to choose a new owner for the account and hosting plan associated with it. The tool should automatically detect if there are any MySQL databases, Email address, FTP users, or any other data that should be moved. Once you’ve confirmed the list is good click Start Conversion to being the process. How long it takes will very much depend on how much data needs to be migrated. For a single small WP install this should only take a minute or two. Once completed you’ll find the new account in WHM under List Accounts. For DoOO environments you may wish to also setup an order in WHMCS associated with a user who will need cPanel access.